Is expanding desertification raising the severity of sandstorms? Cao Li and Hu Yinan in Beijing report. The sky across North China turned dark yellow over the weekend as the biggest sandstorm this year offered a grim reminder of the impact of the country's worsening desertification. Tons of sand carried by winds of up to 100 km/h have affected more than 270 million people in 16 provinces since Friday, covering about 2 million sq km, said meteorological experts. The storm, the worst since January last year, reached Shanghai on Sunday. Thanks to overgrazing, deforestation, urbanization and drought, deserts now make up more than 16 percent of the country, and scientists say the shifting sands are increasing the risk of sandstorms - the grit from which could travel as far as the western United States. The Chinese Academy of Sciences estimates that the number of sandstorms has jumped six-fold in the past 50 years to two dozen a year. Around 80 percent of sandstorms occur between March and May, with the country experiencing an average of 5.2 dusty days - often a byproduct of sandstorms - in April, said Lin Jian, chief forecaster with the China Meteorological Administration. However, as the dusty weather started later than usual this year, it could indicate that the number of sandstorms may be fewer than in recent years, he said. 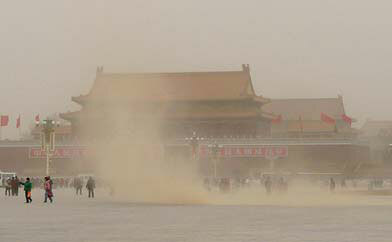 In Beijing, residents woke on Saturday morning to find the city's streets blanketed by yellow dust. According to the National Meteorological Center, the sand traveled from deserts in the Mongolian People's Republic and the Inner Mongolia autonomous region. service between Beijing and Shijiazhuang, Hebei province, was also suspended for about two hours. Residents were advised to keep windows closed, and to use masks and scarves to protect their eyes and mouths while outside. "Sandstorms can cause serious illnesses, and can affect the eyes and respiratory system," said Chao Enxiang, a doctor with the capital's China-Japan Friendship Hospital. "If this storm continues, hospitals will definitely see the number of patients increase." The storm also affected power supplies in cities across North China, and even severed Internet links for several hours. Drivers had to turn on their car headlights to see through the midday dust, while some of the passenger ships scheduled to leave ports in Shandong province were delayed. Mending ties with waidiren is a priority for the much-maligned Shanghainese as the city sets out to prove it can be a gracious Expo host. When it came to choosing a new watch, Ma Jun had no hesitation in selecting a $6,800 Omega Constellation over a Rolex.